The entry-level home security camera from Nest costs $200 and the high-end Nest Cam IQ rings up at a sky-high price of $300. They’re both great devices, but neither one even comes close to offering the kind of functionality you’ll get from the newest best-selling camera on Amazon. 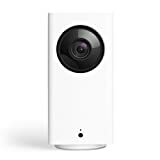 The Wyze Cam Pan Indoor Smart Home Camera costs all of $36 with free Prime shipping, and yet it packs some seriously impressive features. Examples include the ability to pan and zoom from the app, a motion tracking feature that pans and zooms automatically, and an unprecedented 14 days of free cloud storage!